Pastry blender (also known as pastry cutter) is one of the necessary kitchen gadgets you will need, if your recipe calls for a streusel. I have been making streusel with the use of a fork, or just plain hands, but having the pastry blender is such a big help, and so much easier to get the job done. 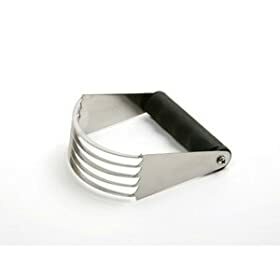 It is very easy to hold, due to it’s nice, sturdy handle, and the metal blades cut very nicely into the flour, sugar, and butter, transforming it into scrumptious streusel crumbs. Accomplishing this with a fork is doable, but the slim fork handle tires out your hand muscles. Then again, if you try doing it with your hands, the warmth of your hands melts the butter, making the job quite messy. It is a small investment, since it’s very reasonably priced, but a priceless addition to your gadget collection.